Work hardening hi-density DuPont type polymer with a precision insert balanced with a special core.. Lifetime (return for replacement) Guarantee ! Presented in a velvet bag inside an engraved wooden "Treasure Chest" with an extra bag for picks as well. 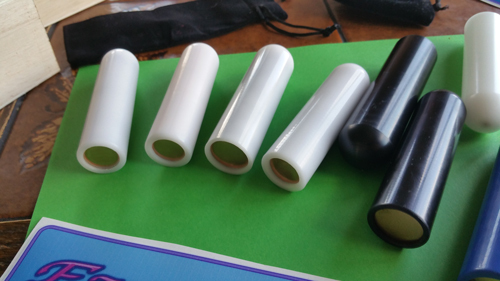 Available in Black or White, in popular lengths with diameters of 3/4", 7/8" 15/16” and 1". 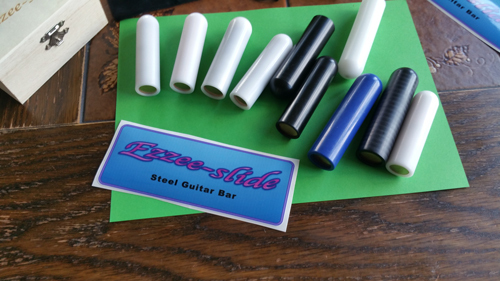 Ezzee~slide Bar prices.. are based on 2010 prices of a similar type bar. David Hartley said; "I used one of these bars at the weekend for the whole time I was playing some steel. It really is smooth, the weight was good for me and Basil made it with the same dimensions as my BJS John Hughey bar. It is one I will use a lot of the time. It does have no noise I could hear on the slides I used, and sustain was as good as a steel bar. The tone was a bit more mellow than the BJS. 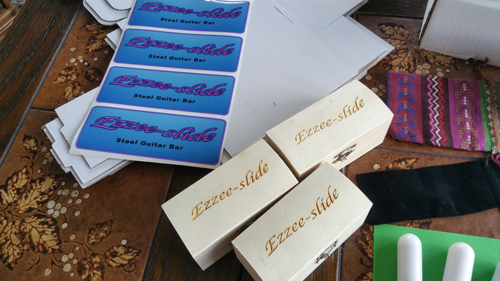 You would be pleasantly surprised with the Ezzee-slide bar. David Hartley..
Ken Byng said "Here is a piece that I wrote this morning on the British Steelies web site. "Well while on the subject of Tribo-Tone Basil, Maurice Anderson gave me a TT bar quite a few years ago as a gift. I wasn't enamoured by it too much at first, but it did improve after a bit of use. 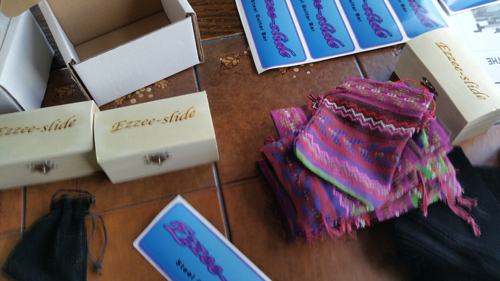 While the Ezzee Slide looks identical to the TT bar, there is a substantive difference on first use. Basil's bar is much slicker, so it is apparent that he has used a different type of polymer to Eric Ebner, manufacturer of the TT bar. 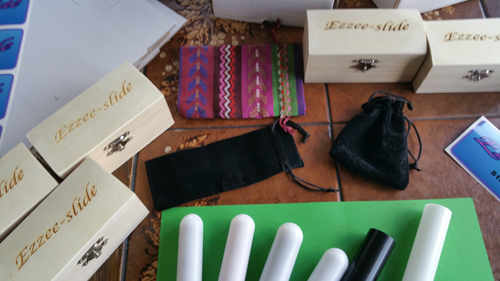 My Tribo-Tone bar is on its way to one of my pupils as it is redundant. I bought a 1" Ezzee bar after buying one of Ben Burrow's excellent 1" stainless bars recently. While the Ezzee is considerably lighter in use to Ben's bar, it still weighs in around 7.5 ounces. Also in use, the Ezzee bar is very slick on the strings and easy to manipulate on faster passages. The big difference between the Ezzee bar and my stainless and chromed steel bars is a slightly mellower tone on the unwound strings, which is a big plus for my personal taste. To'ing and fro'ing between polymer and steel bars highlighted the more metallic tone of the latter on the unwound strings, which is pretty logical. The tone of the Ezzee bar on the strings is more pleasing to my ears. Overall, I am very impressed with Basil's bar and while it is priced at 2 or 3 times the cost of a traditional stainless or chromed bar, it must be remembered that the manufacturing process of his bars is way more complex. It comes in a nice presentation box complete with drawstring bag for both the bar plus a second one for storing picks. I will still continue to use my all metal bars, but having the Ezzee bar in my armoury means that it will be my primary 'go to' bar"." I just finished my first show minutes ago with the 7/8 bar and it was great. Hot day, outside in the sun and I had no problem hanging on to it. I'm an intermediate player at best, so take this with that in mind, but it seems the best of steel and Tribotone. Super low string noise, no string resistance, and a brighter tone than Tribotone. I wouldn't change a thing. The 3/4 bar was a gift for a friend. The tone and feel are great. I have Burden, Tribotone, and BJS in that size and I like the Ezzee-slide better than all of those. Great job engineering these beasts. Quote from a new user "Basil! Having just tried out the bar, I can state that it is everything I'd hoped - virtually noiseless, light, smooth, and even beautiful. It is a fine product, and will absolutely be my "go-to" bar, except for times where I need a little more weight.. At some point, I will purchase a heavier bar from you, for a complete set! "I am very very impressed with the bar, and will absolutely recommend it to everyone - great price for what you receive, as well. Thank you very much, Basil. 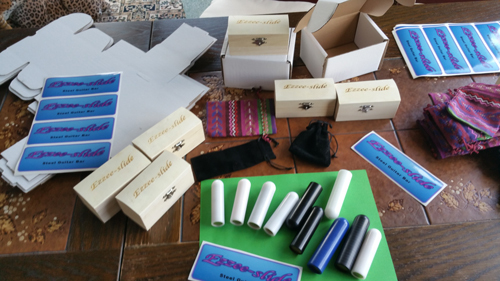 I am most satisfied"
I received my bar today - incredible packaging, pure beauty of a bar! Thank you very very very much - absolutely stunning. I run down to my Music room and gut stuck there for an hour or more! Ezzee slide is very nice in my hand. I am amazed about the smoth friction against the strings! This will be recommended by me to my steeling friends. I will for sure take a small video to put up on FB for all steelers to see and hear later! Thank you very much Basil. 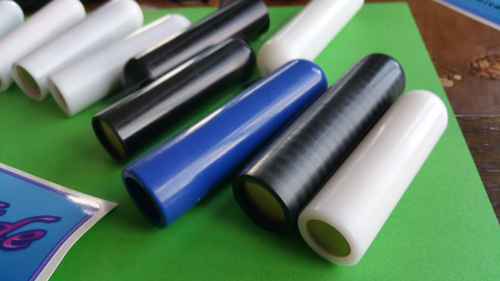 I sent him a choice, the bar he ordered and one that had the most unusual "Tiger Stripe" markings..Strange things can happen in the polymer cooling process. HI Basil. Hahaha,,,, I just found your letter in the box that the bars came in! No way that I send one bar back. I gonna keep them both. Can I send to you over PayPal? Just let me know. The bars is very nice! And wouldn't you know that a Pirate would appreciate the "Pirate's Chest" box the bar comes in..
Quote "Well, well... My friendly postal representative brought a package from overseas today. I'm loving the tone and feel of both bars. Great work done by you and your thousands of employees! The bar seems quite wonderful. But I sure like the slick and quiet compared to my old Dunlop. Ken Byng These bars are the single biggest factor that you can have to improve your playing and tone. Kudos to Basil Henriques's bar that I used over the weekend. The more I used it the more that I came to the conclusion that it has really improved my tone. I am not on commission (yet - ha) and can truthfully say that this item is one of the biggest game changers for steel players that they can get for the money. An absolutely brilliant product. 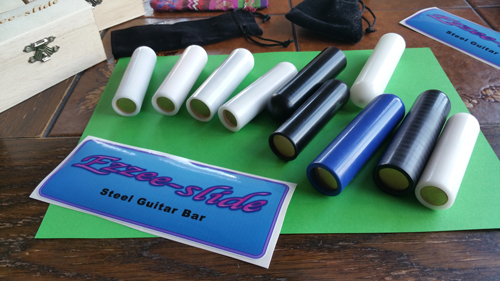 Tone is so important to me, and the Ezee Slide tone bar is definitely the way to go. S&H extra at cost only..(No markup) insured tracked & "signed for"
Select the aproppriate option in the “Drop Down” menu for the relevant bar. 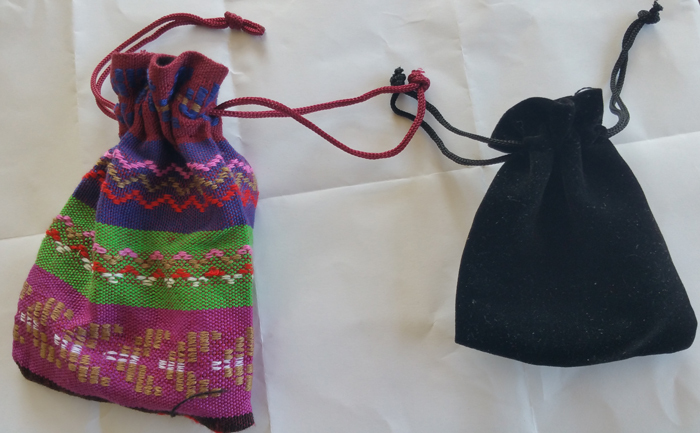 The bag for the picks is Black Velvet, the bag for the bar has two options Black Velvet or Native Art. I reccomend a robust “Running Period” for the first few weeks as the bar reaches its potential hardness.